SaaS Startups: Should You Focus on Retention or Upsells? Somewhere in between the 1–3 year mark for any SaaS startup comes a startling revelation: “oh my god, I didn’t focus enough on customer success.” When you’re spending 80–100 hours/week paranoid about product release schedules and your sales team hitting quotas, customer retention is often the #1 thing new entrepreneurs will underinvest in early on. But let’s say that you’re hitting your first batch of renewals and the numbers don’t look great: nearly 50% of them didn’t re-up! You’ve read plenty on churn benchmarks and know this will crush your growth unless you do something about it. VCs will tell you that an ideal net churn rate is around 0% or better (and you’re not even close to that). And if you can get there, then your LTV/CAC is probably strong enough that you can scale into a truly exponential-growth business. So how the hell do you accomplish that? And what should your CS team be prioritizing? Not everyone can be payroll software. Certain SaaS businesses have a high-degree of lock-in created by sheer inertia once you’ve reached certain milestones of data consolidation or team dependency. If you’re in one of these categories and you don’t have close to 100% renewal rates, then most likely it’s either your product’s fault (you’re not solving a core issue) or it’s an onboarding/training problem (the customer isn’t getting to the a-ha moment). But not all SaaS companies are like this. For example, if you’re targeting startups and SMBs, you’re likely getting a bunch of logo churn that’s not even within your control, based on factors like ultra-frugal decision-making and going bankrupt. Other industries have natural churn caused by key-man budget risk or usage that relies on team performance (ad/marketing tech is one of these). For these entrepreneurs, no matter how many phone calls, webinars and blog posts your customer success team does, you can’t save every client. OK so you’re not going to be able to get to that magical 0% churn number by saving every client… but if that’s the case, your revenue model MUST scale with your clients’ success to make up for it. This starts with a pricing model that is tied to value creation. Not just seats and features — are your most successful clients necessarily in bigger teams? Great examples of tying value to revenue are Segment/Mixpanel (data-points), Intercom (users tracked) and Nanigans (tiers based on Facebook ad spend). Next, your customer success team needs to proactively know and dictate how to do your clients’ job better than them (an exaggeration, but not really), rather than being purely reactive. Are they allocating their budget correctly? What customer strategy should they be using? How can they decrease CPAs in these channels? Your objective is for your best clients to crush their own performance goals so their business with you expands. If you can pull this off, you’re as good (or better) as if you had that perfect 100% renewal rate. 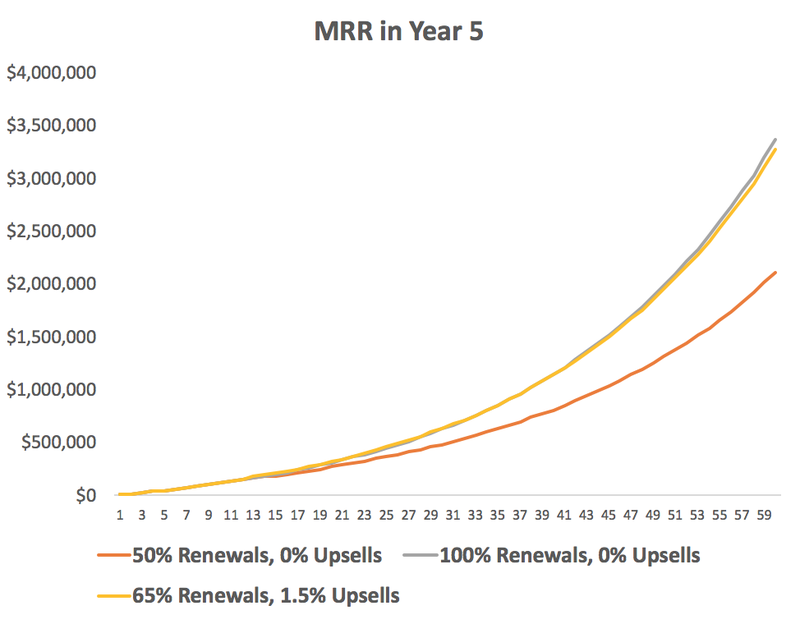 Here’s an example MRR chart showing the two scenarios: 1) perfecting your renewals to 100% or 2) slightly improving them to 65% but adding 1.5% in upsells per month(hint: they’re almost the same). Hope this was helpful! What have been some ways you’ve helped drive upsells and retention? Leave a comment below. Eric Lam is the Co-founder & CEO of AspireIQ, the content generation & analytics software platform with 80+ brand clients like Hello Fresh, Tuft & Needle and Dyson.